The beauty evolution of the 'Fifty Shades of Grey' star. 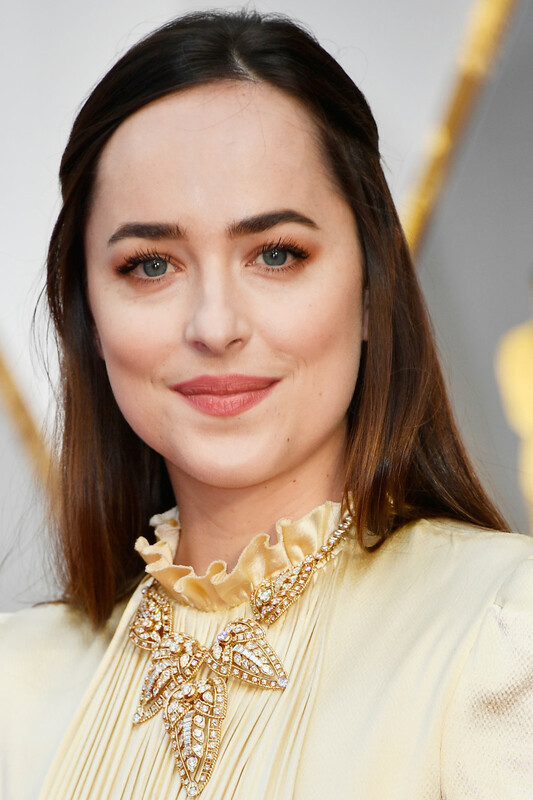 As far as beauty evolutions go, Dakota Johnson&apos;s is a pretty fascinating one. Like most of us, the 26-year-old actress has done her fair share of beauty experimentation over the years—especially with her hair. She&apos;s played with various cuts (from bangs to bobs), textures (wavy and straight), and most of all, hair colours. With her blue eyes and natural brown hair, Dakota is a colour chameleon who can pull off blonde, brunette and red. But it wasn&apos;t until she committed to a rich brown with bangs for her breakout role in Fifty Shades of Grey that she started exuding real star power. That&apos;s what happens when you nail your Life Cut and Colour, folks! Dakota Johnson at the 2003 New York premiere of &apos;The Cheetah Girls&apos;. Would you have recognized Dakota here? She was just 14, and sporting what I assume is her natural hair colour, a warm mid-brunette. Also her natural nose! I definitely think she tweaked it later on, but maybe not her lips—as you can see, the upper one was always quite full. Is anyone else getting a Jennifer Lawrence vibe? I think it&apos;s the lighter hair, and the eyes. Dakota Johnson at Teen Vogue&apos;s 2004 Young Hollywood party. Dakota started her blondification at age 15. It&apos;s funny, the Young Hollywood party is still happening now, 12 years later, and the celebs who attend are so hyper-groomed. Back then, it wasn&apos;t the case—Dakota&apos;s hair looks un-styled, she&apos;s not wearing much makeup, and it doesn&apos;t look like a stylist was involved with her jewellery choices. Dakota Johnson at the 2006 Golden Globe Awards. Two years later, Dakota went even blonder and got bangs. She also started dialling up the eye makeup (as you do, at age 17). You can really see how the tip of her nose used to be longer. 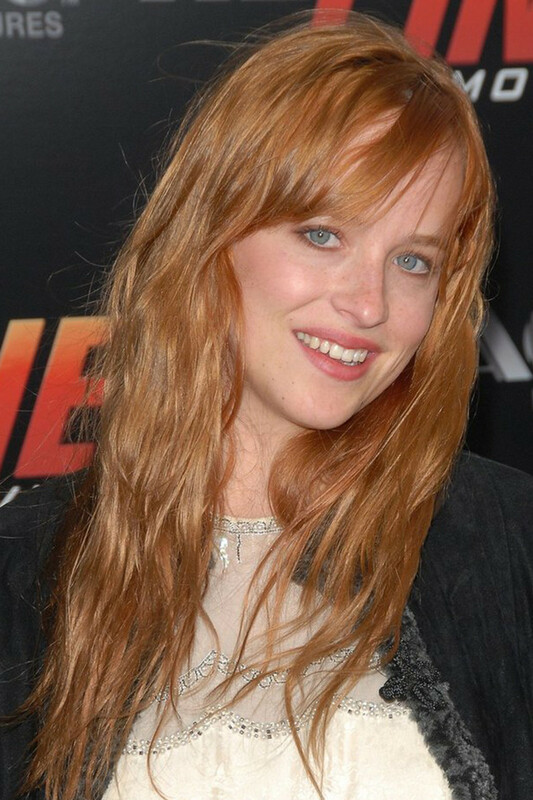 Dakota Johnson at the 2007 premiere of &apos;Redline&apos;. Surprise! Dakota had strawberry blonde hair at one point, and I LOVE it—the shade looks extremely natural with her blue eyes and freckles. This entire look is still on point, thanks to the soft makeup, stained lips, long bangs and beautiful wavy texture. Dakota Johnson at Mango&apos;s New York store re-launch in 2008. Alas, the red didn&apos;t last long. In 2008, Dakota chopped it into a layered long bob, and went back to blonde. I don&apos;t find it nearly as flattering, nor do I like the heavy eye makeup on her. This just doesn&apos;t have that signature Dakota effortlessness, you know? Dakota Johnson at the 2010 Art of Elysium Bright Lights event. Dakota Johnson at the 2011 LACMA Art + Film Gala. Dakota Johnson at a Hollywood Reporter event in 2012. Dakota reached peak blondeness in 2012. She was 23 here. The bangs are back, and so is her natural straight texture—it&apos;s just the colour that is not working with her skin tone. Notice her return to dark brows, which frame her eyes well. Dakota Johnson at the 2013 LACMA Art + Film Gala. Wow! Going darker was a HUGE transformation for Dakota. Suddenly she looks fresher, younger and 100 percent more chic. It makes her blue eyes pop (also thanks to the smoky-shimmery eye makeup) and shows off her flawless complexion. Her brows are even more perfected—a little fuller, beautifully angled, and with the covetable "fans" at the inner corners. She must&apos;ve started working with her A-list beauty team at this point! I&apos;m just not sure about her upper lip. Enhanced or au naturel? Dakota Johnson at the 2014 Met Gala. This was Dakota&apos;s first major red carpet event after being announced as the star of &apos;Fifty Shades&apos;. Finally, she&apos;s landed on her signature style: bangs and long brown hair, sometimes with Ombré, and sophisticated makeup. I love this because she seemed kind of generic as a blonde, but as a brunette, she truly shines. Dakota Johnson at the 2015 Met Gala. In 2015, Dakota was filming How to Be Single, and I love her hair in that movie—and in this photo. It&apos;s a darker, more solid brown and a shorter bob length; totally adorable. This graphic eye makeup is also super-creative, and solidifies her new "cool girl" status on the red carpet. Again, not sure what&apos;s happening with her upper lip; it looks much larger than the lower one. Dakota Johnson at the 2016 BAFTA Awards. That brings us to 2016, and Dakota&apos;s still got the darker brown hair and bangs; she just grew out the length a little (well, actually, I think it&apos;s extensions). If you ask me, her beauty look keeps getting better and better! There aren&apos;t enough actresses using makeup in a creative, elegant way instead of the usual Kardashian-esque contouring. I also find it extremely refreshing to see a carefree natural hair texture instead of stiff, over-styled waves and updos. Now, whether her nose or lips are natural is another story... but all in all, I think she looks amazing. Dakota Johnson at the 2017 Oscars. In 2017, Dakota grew out her bangs for a while, pinning them off her face... I don&apos;t like it! With a newly darker brunette colour, and darkened brows, it just seems harsh. Well, the choice of dress wasn&apos;t helping matters, either. Dakota Johnson in 2003 (left) and in 2016 (right). Like I always say, most celebs in Hollywood have had nose jobs. It&apos;s just the way it is—a career decision. Dakota is no exception. It&apos;s clear from skimming these photos that she has altered her nose... and I think the result did turn out great. As for her upper lip, I&apos;m not sure! It does look quite full in the earlier shots, but in more recent years, seems to have inflated even more. Plus, lip injections are the trendy thing to do these days—so it would not surprise me at all if she was getting them. However, the changes I actually find most interesting here are the hair colour ones. So many of us (including me!) go through the same process as Dakota did before we figure out our Life Colour. Usually, blonde is the first stop—but as you can see, it&apos;s not always the best choice at all. I think (I hope!) we might be seeing a trend away from cookie cutter bleached blonde. As Dakota demonstrates, there are so many other beautiful hair colours, and it&apos;s all about what flatters your skin tone. If only someone could give last week&apos;s Before & After, Rosie Huntington-Whiteley, that memo! How do you feel about Dakota&apos;s beauty evolution? The beauty evolution of the 'Iron Man' star and Goop founder.